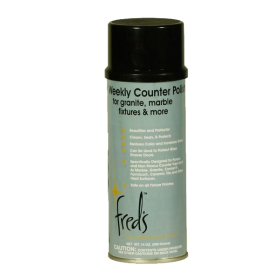 Use Fred's Daily Counter Cleaner to clean and maintain surfaces and Fred's Weekly Counter Polish to protect and make future cleaning easier!! Easy to use, protects and shines with no streaking! Fred's Weekly Counter Polish can safely be used on any above-the-floor hard surface to protect and make future cleaning easier!!! * Specifically designed for porous and non-porous counter tops such as granite, marble, Corrian, Formica, ceramic tile and other hard surfaces. * Safe on all fixture finishes. * Great for use in kitchens and bathrooms. * Use on cleaned glass shower doors to repel water and soap scum. Some other uses for Fred's Weekly Counter Polish: enamel or glass cook tops, sink basins, toilets, door hardware and drawer pulls, windows with sprinkler over spray problems (remove hard water deposits with Fred's PTC Green then treat glass with Fred's Weekly Counter Polish), Glass patio tables, car rims and high-end brake calipers (protects against brake dust), boat hardware (remove corrosion with Flitz Metal Polish follow with Fred's Weekly Counter Polish to protect against water and corrosion), and windscreens. Apply with Fred's Microfiber Applicator Sponge or with Fred's Ultra Plush Towels.